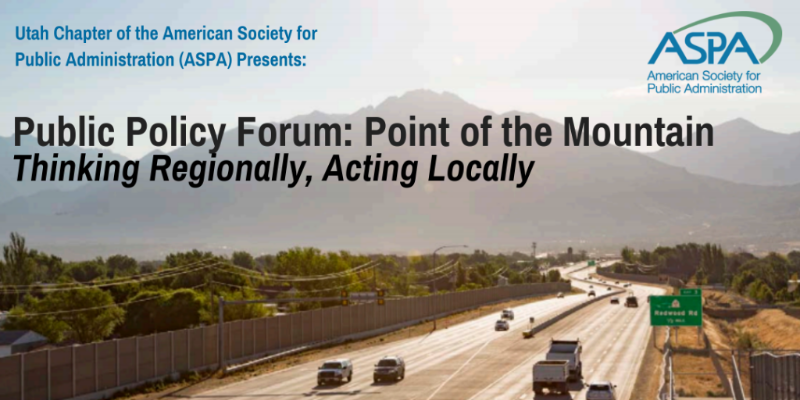 Please join the Utah Chapter of the American Society for Public Administration for an important public policy forum: Thinking Regionally, Acting Locally at Point of the Mountain. This event will address large scale transportation and development needs, while maintaining local government control at the Point of the Mountain. Learn from and interact with members of our state legislature, transit operator, regional transportation planning organizations, community leaders, and local elected leaders who will explain how they tackle the key issues and opportunities around the Point of the Mountain. LaNiece Davenport, Government Relations Manager, Wasatch Front Regional Council (WFRC), will moderate. Panelists include Representative V. Lowry Snow, Co-Chair, Point of the Mountain Development Commission; Ari Bruening, President and Chief Operating Officer, Envision Utah; Laura Hanson, Director of Planning, Utah Transit Authority; Wilf Sommerkorn, Director of Regional Planning and Transportation, Salt Lake County; and Mayor Troy Walker, Draper City. Time will be reserved for dialogue and questions from the audience. The Utah Pedestrian Summit, hosted by Utah Department of Transportation, in coordination with WFRC and other partners, is an event for design, health, and safety officials to work together and improve the pedestrian experience in our communities. Created to foster discussion and interaction between presenters and participants, the event will focus on a variety of topics including safety education programs and engineering, design, health, and enforcement opportunities. The American Association of State Highway and Transportation Officials (AASHTO) Board of Directors elected Carlos Braceras, Executive Director, Utah Department of Transportation (UDOT), to serve as its 2018-2019 president. Carlos, who previously served as AASHTO’s vice president and secretary-treasurer, plans to focus on three “emphasis areas” during his term, including workforce development, reauthorization of current surface transportation legislation, and communication of transportation’s vital role in American life. The Utah Transit Authority (UTA) was recently awarded $11 million in grant funding from the US Department of Transportation’s Federal Transit Authority (FTA). The funding supports improvements to the safety and reliability of America’s bus systems, as well as enhances mobility for transit riders. This grant award will allow UTA to construct maintenance and operations buildings at the Depot District Clean Fuel Technology Center in Salt Lake City. The project will allow the service and maintenance of diesel, electric, and natural gas buses to be centralized. The demand for this funding from the Buses and Bus Facilities Infrastructure Investment Program was high, with more than 250 applicants competing for approximately $366 million. Utah’s project was one of 107 projects to receive an award. Congratulations to UTA! As part of a settlement with Volkswagen (VW) for violations of the Clean Air Act, the State of Utah was awarded over $35 million from the VW Environmental Mitigation Trust. VW admitted to secretly installing illegal software, which “cheats” engine certification and emissions testing by producing testing results that comply with federal law. In actuality, the engines emit up to 40 times the allowable emissions of nitrogen oxides (NOx) under normal driving conditions. Governor Gary R. Herbert designated the Utah Department of Environmental Quality (UDEQ) as the lead agency to administer this funding, including the development of an Environmental Mitigation Plan (EMP). All VW funds will be used for public fleets, except for projects funded through the Diesel Emission Reduction Act category. According to the UDEQ website, "UDEQ estimates the lifetime NOx emitted by the non-compliant vehicles to be between 351 and 1,556 tons of NOx over the span of time they were operating in Utah. Approximately 70 percent of the affected vehicles are registered in the seven counties designated as nonattainment of the National Ambient Air Quality Standards for PM2.5 (Box Elder, Cache, Davis, Salt Lake, Tooele, Utah, and Weber)." To learn more and apply for funding, please view the UDEQ website. Applications for funds will be accepted between October 1 and November 30, 2018.